Boy I sure love wildlife but darn the critters sure can be a destructive force! Today I am super ticked off about this! 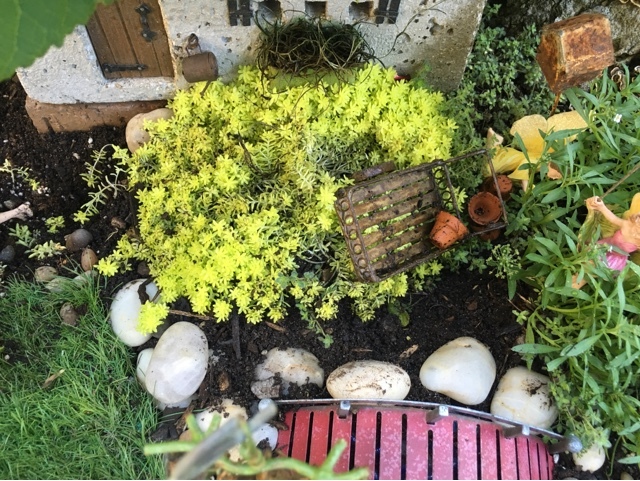 There were two plants of the bright green sedum and as you can see the one on the left was dug right out and pretty much ruined. I fussed with it for a while and tried to put it back together. I hope it grabs hold quickly and doesn't die off on me. There was similar damage done off to the right side too. 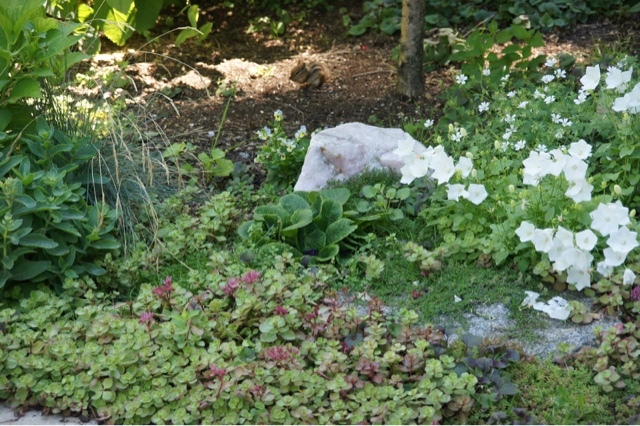 Whatever is doing this tried to undermine the big stone by the pathway and dug away the plants here too. I'm thinking its a skunk because they like grubs and I don't know what is so interesting out here otherwise. This is what it looked like before el'destructo got in there! 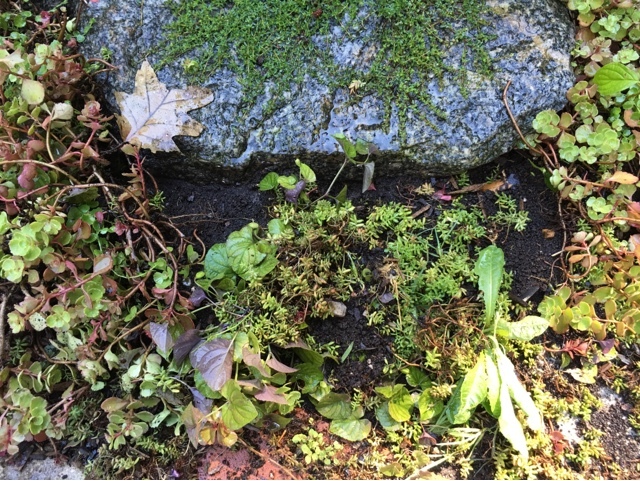 The stone was fully encased by the different plants here. I found a bunch more holes and had to push a bunch plants in place. 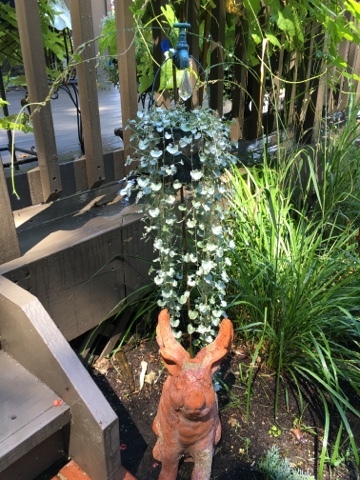 It doesn't care about the plant- it's definitely going for something in the ground. On a brighter note the morning glories are popping out daily! 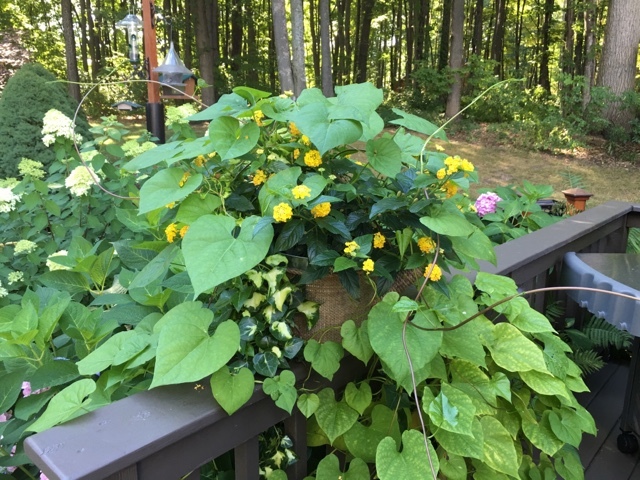 The morning glory plant on the other side has taken over and wrapped itself around this plant on the railing! The humminbgbird really likes this yellow lantana so I might need to control the vine a bit! 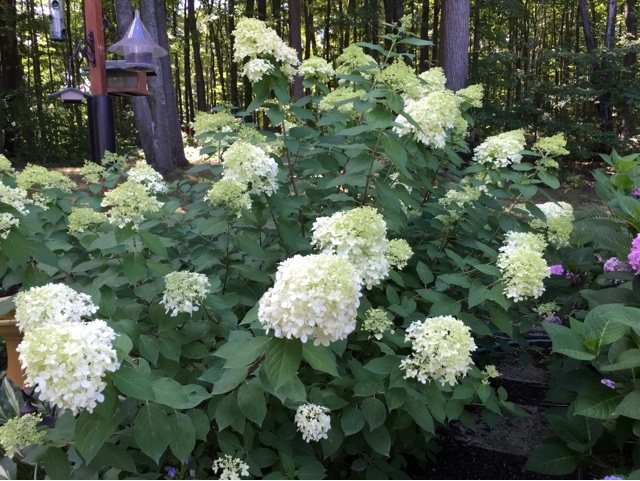 The endless summer hydrangeas are doing fantastic! 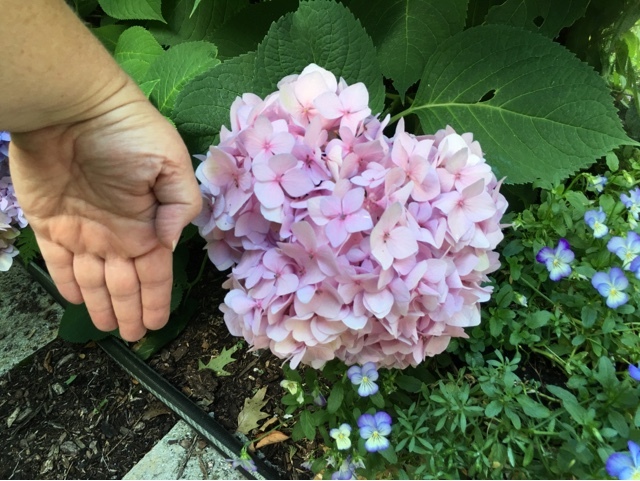 This was one of the first blooms this summer and look how large it is! The Limelights are doing great too! Such a pretty flowering shrub- how can you not like it! 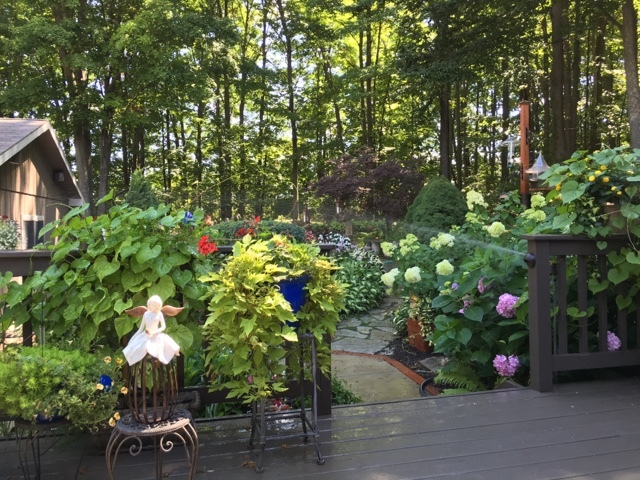 The path between the hydrangeas is a bit crowded but I love it! 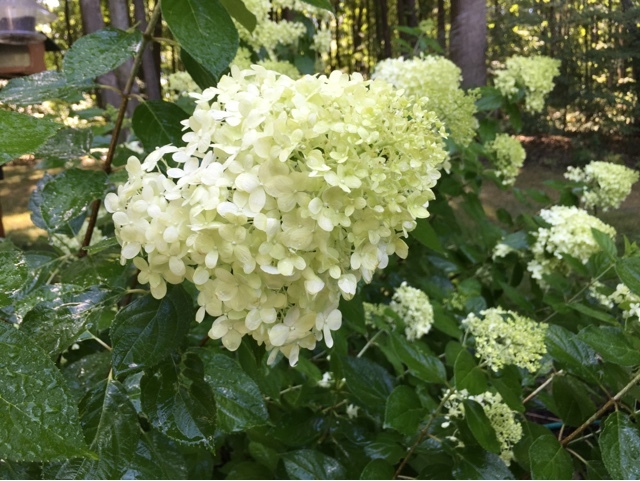 This Cityline Paris hydrangea has 4 blooms this year so I'm pleased about that. 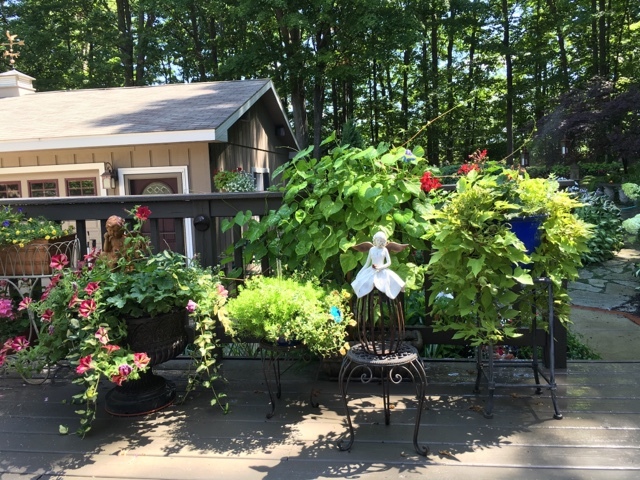 All the blooms are around the outer perimeter. It's very healthy looking but it would be nice to see blooms all over it! Love how this looks like a waterfall! My flying pig was relocated when the deck was re-stained and for how he's acting as my guard dog! 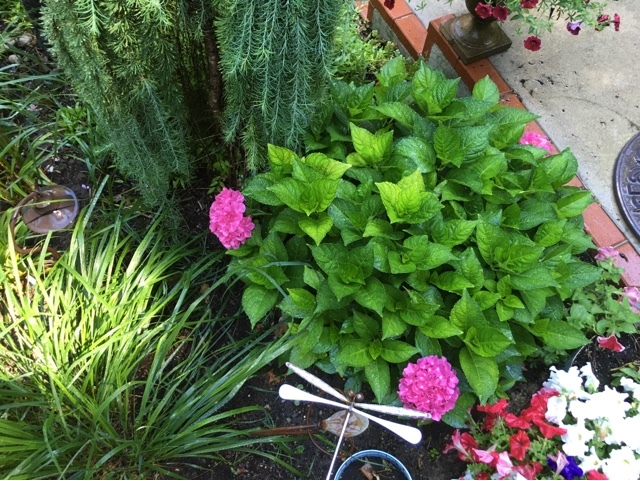 There used to be a big clump of white lilies there but they've disappeared too! 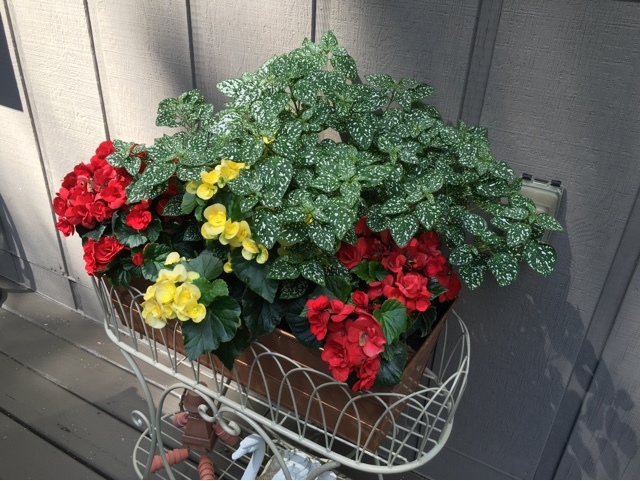 By the house the begonias are doing great along with the polka dot plant which I need to trim again! I've got the sprinklers running and am sitting here enjoying the early afternoon. Despite the critters your garden is a real 'picture' and with the trees on the background a lovely place to live. 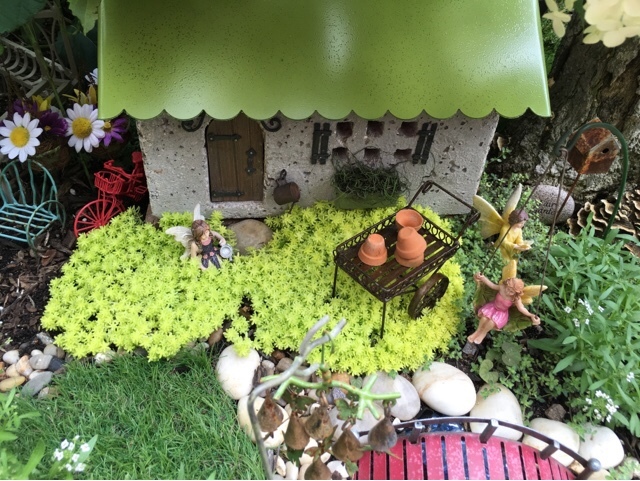 So sad they ruined the Sedums, they were growing so nicely in front of the fairyhouse. 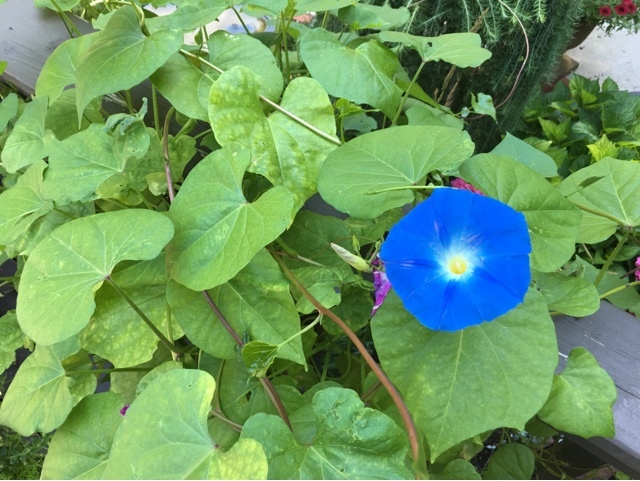 I love the heavenly blue of your Morning Glories, another year I should sow them again in my garden too. Awww. sometimes those critters can be a pain. Your garden is looking so lush and beautiful. 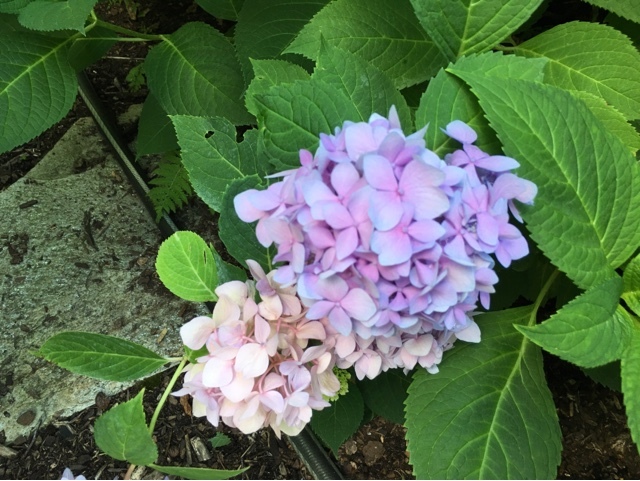 Love your hydrangeas. We have critter issues too. I am enjoying all of your greenery too. 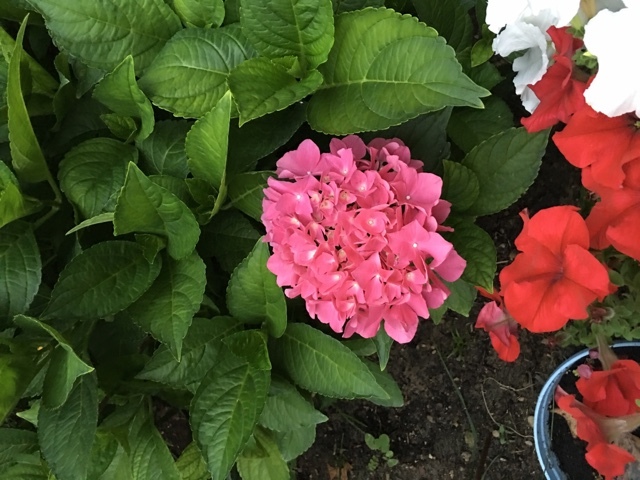 Your hydrangea's are beautiful. Do they get much sun? 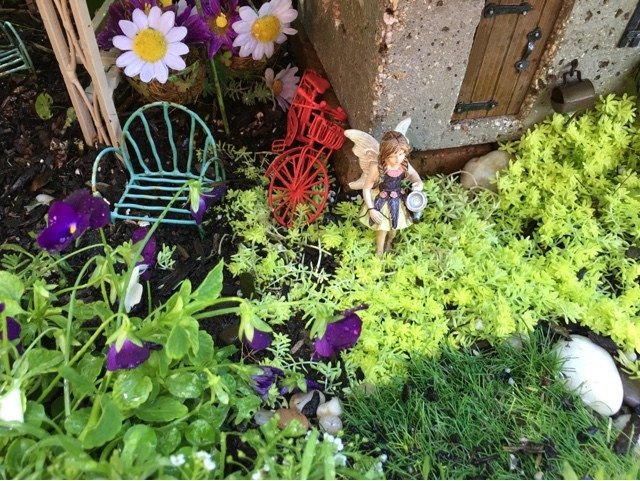 Liz, I know the little critters can be a pain; but, your gardens are still gorgeous! 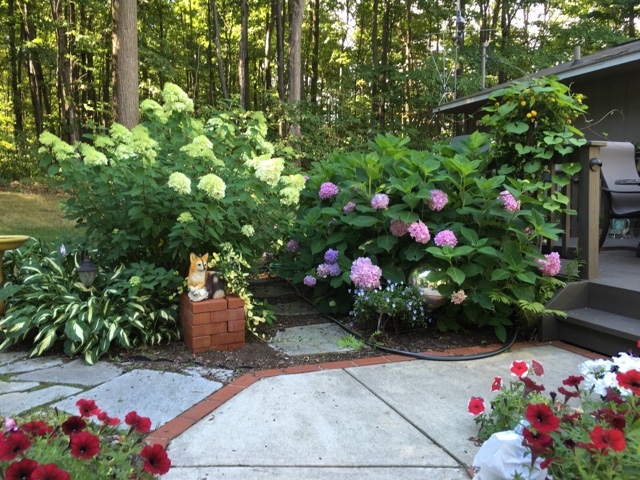 Those hydrangeas just made me smile! Hopefully, whatever is tearing up your plants will move elsewhere soon. Critters can cause damage fast. 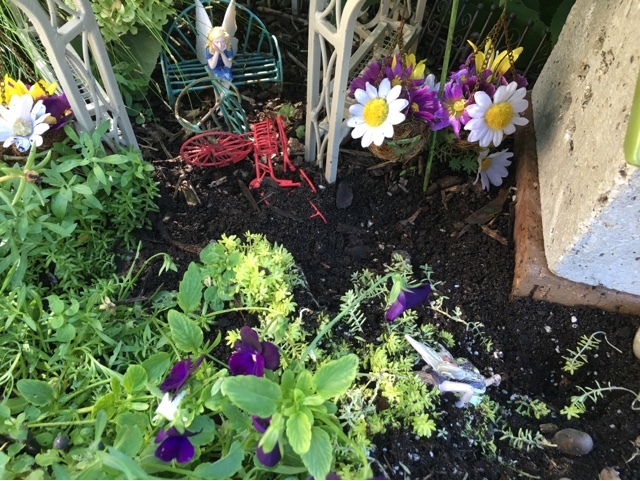 So far I have not had an issue with anything in my garden, but the moles and voles are really doing a mess to my yard. Everything looks great though.